In this article, we are going to learn about circle generating algorithms in computer graphics i.e. Midpoint circle algorithm. Derivation of generating midpoint circle algorithm is also prescribed in this article. 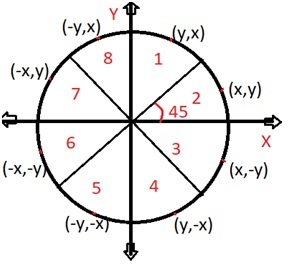 This is an algorithm which is used to calculate the entire perimeter points of a circle in a first octant so that the points of the other octant can be taken easily as they are mirror points; this is due to circle property as it is symmetric about its center. In this algorithm decision parameter is based on a circle equation. As we know that the equation of a circle is x2 +y2 =r2 when the centre is (0, 0). If fcircle < 0 then x, y is inside the circle boundary. If fcircle > 0 then x, y is outside the circle boundary. If fcircle = 0 then x, y is on the circle boundary. pk =fcircle(xk+1,yk-1/2) where pk is a decision parameter and in this ½ is taken because it is a midpoint value through which it is easy to calculate value of yk and yk-1. If pk <0 then midpoint is inside the circle in this condition we select y is yk otherwise we will select next y as yk-1 for the condition of pk > 0. In this the input radius r is there with a centre (xc , yc). To obtain the first point m the circumference of a circle is centered on the origin as (x0,y0) = (0,r). Now at each xk position starting k=0, perform the following task. Determine the symmetry points in the other quadrants. At last repeat steps from 3 to 5 until the condition x>=y.